Innovation reflects a new vision of time meters from the company U-Boat, celebrated its purist, recognizable at first sight design. 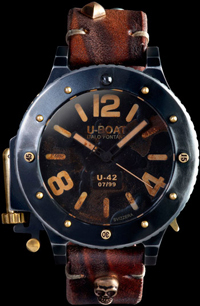 Designer U-Boat – Italo Fontana has developed special watches U-42 Unicum: they come from the past, completely handmade, with individual character. 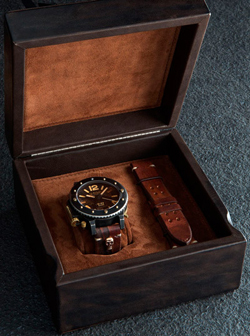 Watches U-42 Unicum – marks the first attempt to create a model of the historic design with a unique decoration and detail, consistent with the future owner. To create a vintage effect of a double convex face, painted in bronze and black, and titanium case and bezel artistically etched with acid. Centre hands through which the display of hours, minutes and seconds, hand paint, then subjected discolored and old. New product comes complete with leather straps and woven dedicated tanners of Tuscany. At customer straps with acids may also be old and are whitewashed. New U-42 Unicum operates on the basis of a modified automatic movement of its own production, which provides 28,800 vibrations per hour and 40-hour power reserve. Caliber, assembled by 25 stones, has a height of 4.60 mm. Functions: hours, minutes, and seconds. Waterproof to 300 meters, the body is made of titanium with black IP. Shell diameter of 53 mm. The back cover, which is engraved with serial numbers recorded six hex screws. Bidirectional rotating bezel ceramic locking lever on the right side on the case. Ball indicator on the bezel at 12 o’clock position is also made of ceramic. Housing is equipped with a front sapphire crystal. Buy watches U-42 Unicum is possible through official representatives of U-Boat.